I was in a dreamy mood when I picked up this book and it was exactly what I was looking for and more! I was transported on an exotic adventure reminiscent of Arabian Nights together with a feisty princess heroine, and a caravan leader whose dark penetrating look had me riveted. The year is 200 B.C. Alia is a 15 year-old princess whose palace lies on the Frankincense Road, a dangerous route through rocky mountains and barren desert, where traders travel to transport the precious resin frankincense that was worth its weight in gold at that time. Illness and financial problems has swept through Alia's town and she isn't content to sit back and do nothing. She knows her father will marry her off, probably for political alliance, and the relationship with her brothers has become strained since her mother died. She is quick-witted and wants to do her share of helping her kingdom. So she disguises herself as a boy to make the journey with a passing caravan to the mysterious incense lands of the south. The journey is dangerous and risky. The traders turn out to be mercenaries, and Alia discovers the meaning of endurance and the cost of making certain decisions. I was quickly engrossed in this novel and liked the characters and especially the historical setting. I was transported to the point where I could feel the heavy heat of the desert sun beating down, or the parched state of the travellers as the water from the skin bottles trickled to a stop. I heard the zing of the swords, the echoing of the horse's hoof steps against the palace walls, and the guttural shouts of the men in their foreign tongues. The scenes were so vivid! The author even includes a glossary in the back of the book for easy reference of Arabic terms. This is a tale filled with adventure, danger, mystery and a budding romance. The scenes between Alia and Kardal, the caravan leader are intense and leave the reader wondering where they will lead. Both of these characters are strong and carried the story forward. There is an element of unpredictability that kept me hooked. The ending left me wanting more, of course, so I am truly hoping there will be a sequel. I did not want it to end. In a way, this is a coming-of-age story about a young women healing from her grief and finding her way in life at a time when a woman's role was limited. She started out a sheltered and naive princess and soon learned through hardship and perseverance how to use your inner strength and her status as royalty to make a difference. So if you are looking for a good historical YA novel to transport you to a different land and culture, this one is sure to please. For my part, I will count this book as one of my favourites for this year. Note: This book is rated C for being a clean read. The book trailer is worth seeing. Check it out! Jody is doing a giveaway on her facebook page for 5 copies, and the winners can choose from print or digital copies. To enter watch The Frankincense Trail book trailer or look at the photos on the website and then visit: https://www.facebook.com/home.php#!/JodyKiharaBooks to tell the author which is your favorite picture. To learn more about this book and its author, visit the TFT website. To purchase the book, visit amazon and barnesandnoble. 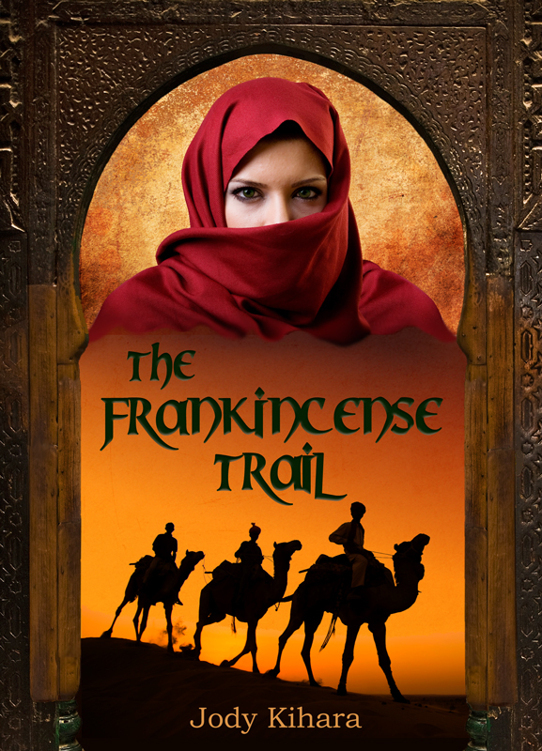 You can also join the Twitter interview with Jody (@JodyKihara) and @LadyStorm33 on Twitter at the end of the tour (on 11/10/11) for a chat on The Frankincense Trail. The hashtag for the chat is #TFT. Disclosure: Thanks to the author and Lightning Book Promotions for sending me this book for review. I was not compensated in any other way, nor told how to rate or review this product. Wow, it sounds like this book is extremely well written since it transported you to another place and time. The fact that it might be a favorite of the year says a lot. It sounds like there's a lot going on in this book to keep your attention. Great review! Wow, what a great review! Thanks so much for being a part of this tour. This would not normally be a novel that I would pick up, but your review has left me curious about it. Thanks so much for your wonderful review, Laura! That really made my day. Great review, Laura. I love the idea of the book! Definitely a TBR selection!